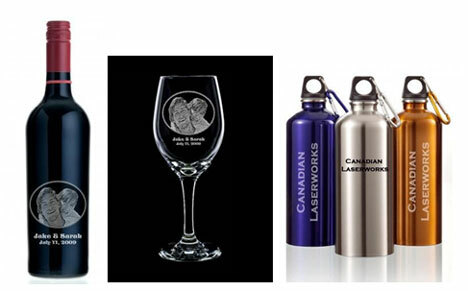 bride.ca | Personalized DIY Wedding Favour Option: Laser-engrave something, anything..
One of the latest companies to list in our wedding services directory is Canadian Laserworks, in Langley BC. What the do is shown above - they can engrave anything, with whatever image/text you give them. The items in the photo are just samples - even though the waterbottles sound like an original and practical idea for an outdoor wedding! But the point is.. you can have anything you want, something you bought in a dollar store, some custom jar of jam grandma made, a weird artifact you brought back from your holiday on Easter Island.. just pick a keepsake that expresses you and your partner and your spirit together perfectly and then personalise it.. Gotta love modern technology. There are less and less limitations to your creativity these days. Canadian Laserworks ships everywhere, but of course you can probably source-out a similar outfit in your town..